There's a joke about Nokia and slam dunking here. But we can't think of it. Today's Nokia Lumia 925 launch event in London came and went without being coupled with an announcement of a Nokia tablet for 2013. However, the Finnish phone manufacturer doesn't sound as if it is ruling out releasing a Nokia Lumia tablet in the near future. "We're very interested in tablets and that's an area we're looking at," said Nokia Executive Vice President of Smart Devices Jo Harlow, according to CNET. 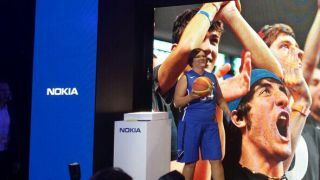 Nokia is "looking at" tablets, but not ready to officially announce a device just yet, as she added, "I don't have any product news I can share." Nokia has been on the record as "looking at" tablets for more than two years now. In 2011, the company's CEO, Stephen Elop, said "Our team right now is assessing what's the right tablet strategy for Nokia." More recently, Elop used Harlow's talking points, saying, "It is something we are clearly looking at very closely." The only concrete evidence that Nokia has taken more than an eyes-on approach to making a tablet comes from design head Marko Ahtisaari, who confirmed "We are working on it" more than a year ago. Nokia tablet with Windows 8? Microsoft was roundly criticized for being late to enter the tablet mix with the Surface in 2012, but its chief phone partner, Nokia, is taking an even longer time to produce a full-sized device. Although Nokia is the No. 2 handset maker in the world, it trails Apple, Samsung, LG, HTC, Motorola, Sony, and even Blackberry in releasing a tablet with a modern-day operating system. Speculation about a Nokia Lumia tablet has immediately pointed to a device running either Windows RT or Windows 8 Pro given the company's close partnership with Microsoft. Whether or not it's a keyboard-equipped Nokia Lumia tablet remains to be seen. However, new phones people are willing to buy like the Lumia 925 and the debut of a tablet could help put Nokia back on top as it was in its Symbian days, and avoid it from resorting to its back-up plan.